Sweden is a dream destination for every fisherman. Whether you are a beginner or an expert, you will most definitely have an unforgettable fishing adventure in this Scandinavian lands. Here you will find everything an enthusiast can wish for – crystal clear waters, big fish, and solemn untouched nature. Huge stocks of various fish species attract even the most season anglers from around the world. Choose your Sweden fishing spot among the countless lakes or along the sea coast. Fans of fly-fishing will be amazed at the number of opportunities for trout fishing nearly everywhere in Sweden. Some areas, especially in the northern part of the country give an incredible chance to fish for whitefish, char and grayling. Salmon provide an exciting fishing experience in Sweden’s rivers. No angler can leave Sweden without trolling for large salmon and sea trout. Fishermen travelling with their family don’t ever have to worry about their loved ones’ leisure time. There is so much to see and to do in Sweden that both kids and older relatives will find themselves busy having fun, while you are enjoying your fishing experience. Keep in mind that weather across the country can vary greatly due to the fact that there is more than 2,000 kilometers from South to North. In January it can be just above zero in southern parts of Sweden, while in Lapland the temperatures can reach 30 degrees below zero with lakes covered in ice. It is crucial to consider these great weather variations, especially if you are planning to travel to the north of the country as waters are ice-free there only for three months a year. This fishing method is much more common in Sweden than in many other countries. Many rivers and lakes are so deep and large, that fishing from boat becomes the only chance for a better catch and new dimension. In many areas it is possible to hire fishing boats with and without motor. This is usually the most effective method for fishing predator fish. Wobbler is the most common bait for pike, salmon, zander and trout. If you are going to fish for sea trout along the coast, use long thin spoons combines with flies on a dropper. 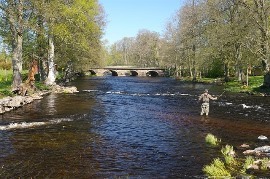 Fly fishing is one of the most frequently used methods in Sweden. Not only trout and grayling can be caught on fly, but also char, salmon and sea trout. Some fishers can even catch pike and perch on fly. Fly fishing is quite popular along the sea coast. In Southern Sweden it is especially popular to troll for salmon and trout. Lakes Vättern and Vänern are the most frequently-visited destinations for trolling. Boats for this fishing method are usually equipped with special gear such as fish finders, rod holders, down riggers, etc. However, trolling from rowing boats is also quite common. Ice fishing is an extremely common fishing method in the Northern Sweden, where lakes are covered with the thick layer of ice for a large part of the year. A unique and must-try type of ice fishing is called “kikmete” or bait watching in Sweden. Fisherman needs to lie belly down on the reindeer skin placed on the ice and watch your bait through the bored hole until fish comes to take it. You will need special tackle for ice fishing that will usually include ice drill, piker spoons, ice fishing rod and special line that doesn’t freeze. As a fishing tourist, remember to always do your research and check the best time for fishing in specific area and the best time to catch the species of your choice. Keep in mind that anglers travel insurance is a must-have when it comes to fishing trips. Accidents and mishaps happen all the time and it is always best to make sure you, your family, as well as your plans and tackle are as safe as possible.